We love the fact that there are a wealth of movies which are starting to use Escrima / Kali for their action scenes rather than Kung Fu which has been the tradition. This is a welcome change as Escrima / Kali look great on screen and help to demonstrate and promote the art to people who may never have come across this martial art before. Of late, the new movie called Hanna uses Escrima. 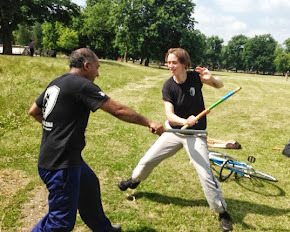 In fact, although Escrima is only used briefly, you can clearly see that some of the main knife techniques which we use in Escrima are used as well as a basic double stick drill, i do not recall double stick drill training used in movies before. Perhaps one of our favourite movies of recent times which demonstrate the effectiveness of Escrima / Kali was the movie Taken with Liam Neeson. This movie clearly used many techniques which were lifted straight from the Escrima handbook. The scenes demonstrated the effectiveness of the system and was one of the view films to show instant kill moves in a realistic manner.